With the "pre-ops ops session" (aka "getting things ready") all done, I had only a few last-minute things to get done before the guys showed up (bring laptop downstairs and get WiFi throttle running, change some batteries in throttles, power up the railroad, stock "O'Rourke's Diner"). Randy showed up first to help out, but with everything done we were able to spend a bit of time flipping through my latest acquisition (which will be the subject of a future post). 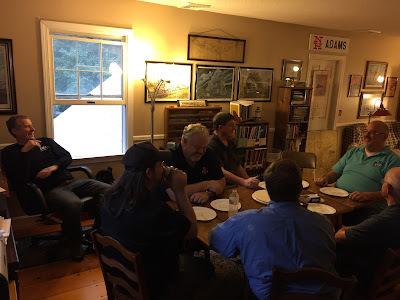 This rare Sunday session was set up especially for guys who live too far away to make it to our monthly Thursday sessions and I was frankly a little humbled by the fact we had guys come from as far away as northern New Jersey and southern New Hampshire - a 5 hour spread(!). Fortunately, Saybrook is pretty centrally located. If you don't count the ocean. 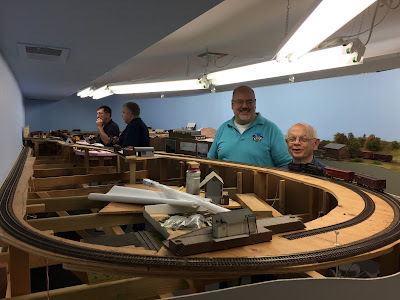 For this session, we had a few regulars (Randy, Tom, Pete), one sophomore (Mike), and four guys operating on the Valley Line for the first time (Dave, JimL, and JimF). We were a little short on crewmembers, so PDX-1 went to Mike who gamely agreed to take the shortest train by himself, and we didn't run any actual mainline trains until that same Mike finished PDX-1 and wanted something else to do. 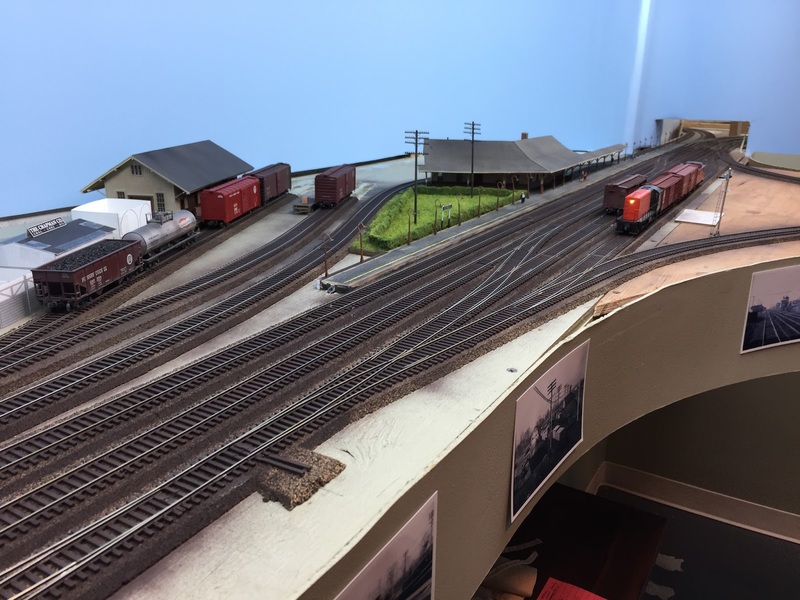 When we do have full crews, the mainline through Saybrook is actually going to be a little stressful with all the trains and both Shoreline locals trying to work and stay out of the way. But it'll provide a really interesting contrast to being out on the branch lines. 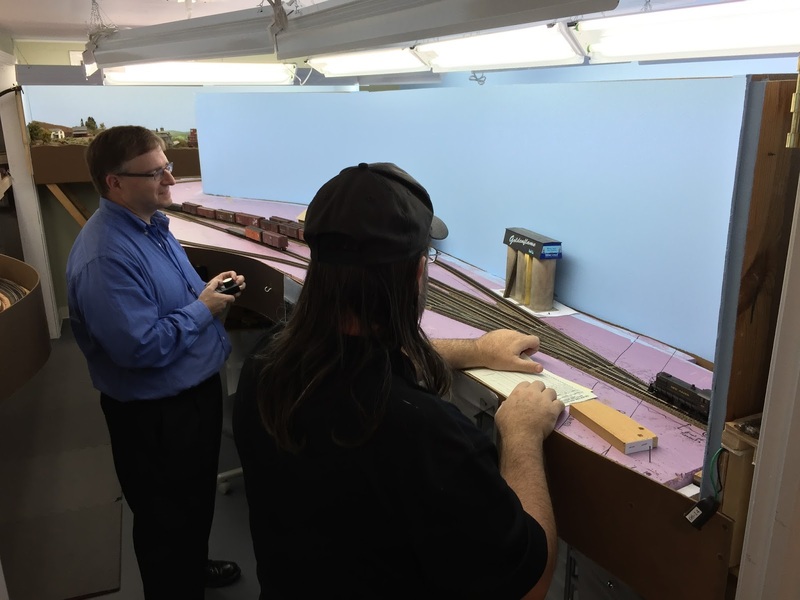 Mike, JimL, and Randy operating the two Shore Line locals (PDX-1 & PDX-2) in Saybrook. The drop-in will be installed at the north end of the wye when PDX-2 is cleared for the trip north up-river. PDX-2 picking up cars for up-river towns which were left by PDX-1 the previous day session. Once PDX-2 left town, and the mainline was clear of traffic, PDX-1 could cross over to pick up New London (eastbound) cars and leave westbound cars for PDX-2 for pickup later in the day. 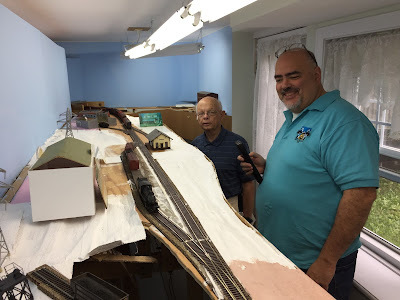 Tom and JimF operating the Air Line local (HDX-12), powered by newly-shopped DERS-2b #0510 in Somerset. With all the cars left there the previous session, they certainly had their work cut out for them and spent 4 hrs switching there (about an hour of actual time). Pete & Dave operating The Valley Local in Wethersfield. This time, I mentioned the F7 brake right at the start of the session. And, yes, I put the shortest and tallest crewmembers together on purpose. Despite - or perhaps because of - how long the Air Line local took in Somerset, it and the Valley Local were both in Middletown at the same time, just like the prototype. Here Dave and Pete are switching Middletown Meat Packing while in the background Tom and JimF switch Middletown yard. Randy and JimL made short work of PDX-2's up-river trip - due primarily to most of the switches being facing point northbound - but had their work cut out for them southbound. Here they are switching Essex. Meanwhile, back on the Shoreline in Saybrook, Mike continued handling the parade of trains that makes this such a busy spot - but a great spot for railfanning! Here's Train 11 - the westbound Bay State - barreling through town without stopping. All in all, the session went really well - even better than last time. WiFi Throttle worked well. Now that I remembered to turn off the laptop's internal WiFi, the WiFi throttle gave us no trouble (I think Mike used that exclusively). Fewer shorts. The shorting issues seem to have diminished just as mysteriously as they appeared a few sessions ago. If I can get around to moving a couple of gaps (to make the reversing sections longer), I think even the remaining shorts will disappear. But nothing will keep a derailing engine from shorting the line - and this session I got an audible reminder to tweak my I-5 steamer. It derailed a couple of times on the main and set off the "short indicator" (buzzer). The DERS-2b (RS-2) was acting a little erratically so needs to have its programming checked and probably redone. We'd tried to upgrade its ESU decoder to the latest "Full Throttle" feature, but I think we only got part way through the process. I tried to fix it with DecoderPro, but I think I need the LokProgrammer to get it really dialed in. The K-1 2-6-0 manifested its "sound but no movement" problem again from a few sessions back. DaveR suspects the decoder may be overheating - which wouldn't be surprising since we routinely have it pulling 15-18 cars(!!). Early in the session, the couple on one of the cars on the Valley Local decided to fall off. We pretended it was broken coupler face and just set the car out on a siding. A car on PDX-2 lost one of its coupler springs. So these two cars will have to be repaired in time for the next session. Speaking of couplers, a few of the guys mentioned difficulties mating KD #5s with "scale" couplers (KD 58s). My long-term plan has been to convert totally to 58s, but I may be accelerating that process. 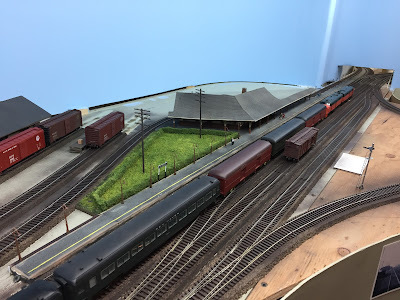 Finally, if I expect to have LOTS of mainline trains running in the future, I need to get around to modifying my passenger cars to make it around the (of course hidden) 24" radius west end return loop. Fortunately - as mentioned above - the WiFi throttle performed like a champ this time (hope I don't jinx it!) and the other throttles did well too. I just have to remember to let folks know that the toggle on top of the throttle is an "on/off" switch not a reversing switch. While not a big problem, I'm seriously considering adding just two more cab panels - one at the end of East End staging and one in front of Rocky Hill - in order to prevent having to stretch the cords quite so far. I created a train register which I used to record all the trains, where they were at what times (both fast time and actual time), and the number of cars they had at each point along the way. 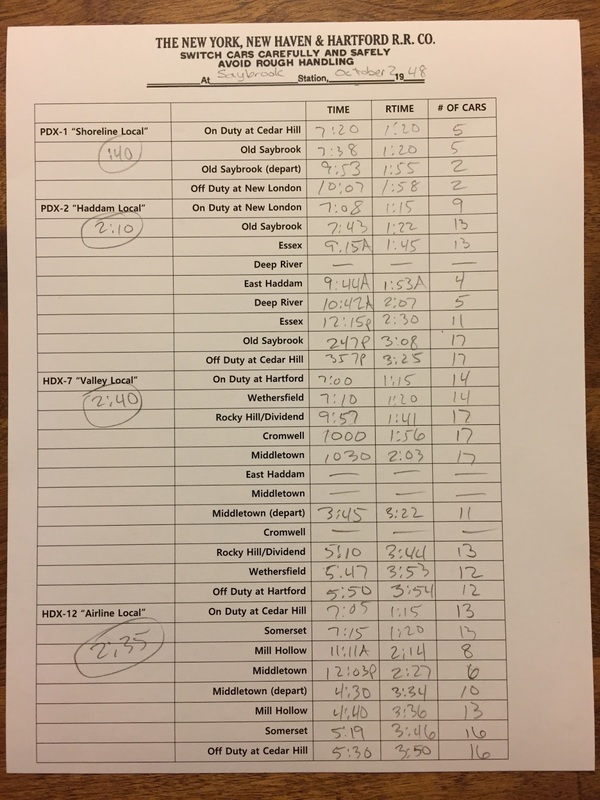 I developed it to get a clearer picture of how long (time) each of the trains take - and how long (cars) each of the trains is at different points in the session. An unanticipated benefit is that it also tells me where everybody is at all times - very useful for my dispatcher role (though, admittedly, this isn't as critical on the branchlines). 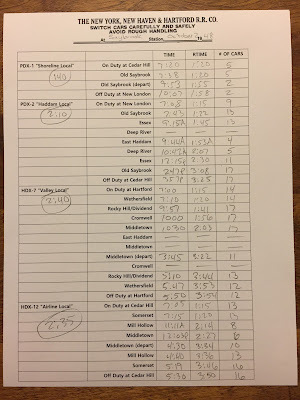 As you can see (or can if you click on the image above), three of the four locals finished all their work within 30 (real) minutes of each other: PDX-2 took 2hrs 10mins, HDX-12 took 2:35, and HDX-7 took 2:40 (but The Valley Local - as this blog's namesake - should take the longest!). 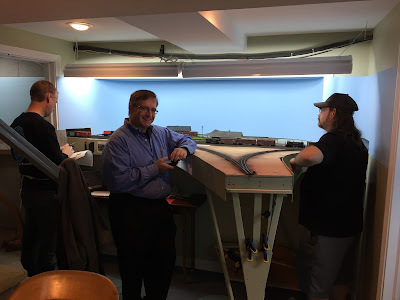 Poor Mike was done after just 40 minutes, but he actually got to run more trains than anybody else. And we moved (picked up or delivered) over 90 cars over the course of about 2hrs 45mins (11hrs fast time). All that work certainly earned the guys a treat, and - unlike past sessions when we'd do the debrief in the basement - we adjourned to the upstairs den (aka the train room, now the crew lounge) for cake made by the Missus, to go over the session a bit, and generally have a good time visiting. 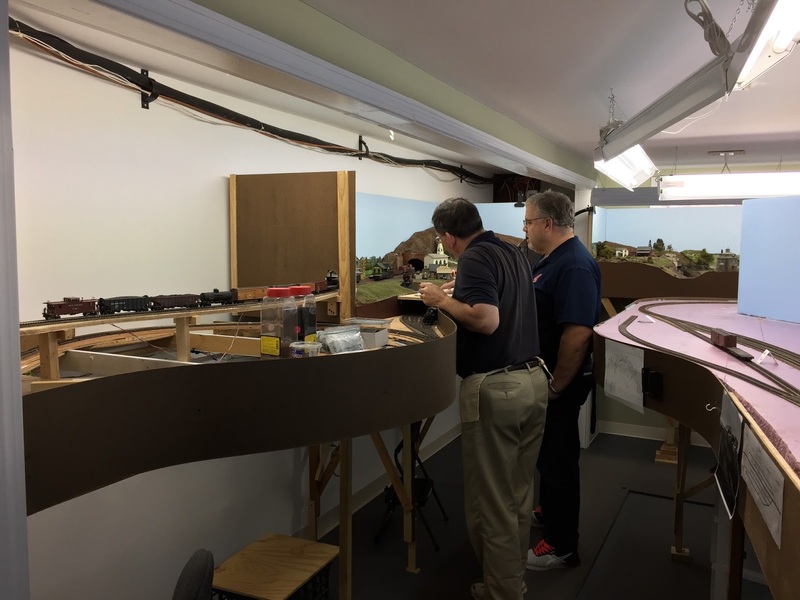 As awesome as it is to see the layout come to life, the best part of operating sessions is having a chance to get together with friends and enjoy each other's company. Many thanks to the guys who came from near and far for a great afternoon on the Valley Line.